A movie studio fixer joins forces with one of its stars to locate one of their biggest box office draws who has been kidnapped by communists. Hail, Caesar! is the Coen brothers at their most playful and is both an affectionate homage to and parody of the Golden Age of Hollywood. It lovingly recreates some of its iconic genres while at the same time amusingly pricking its image of perfection with behind the scenes absurdity. The big name ensemble cast are all eminently watchable, including Josh Brolin as the proxy Noiresque gumshoe studio executive, Scarlett Johansson as a glamorous yet acerbic Brooklyn-accented starlet and Alden Ehrenreich as the goodnatured but talent devoid star of generic cowboy pictures. 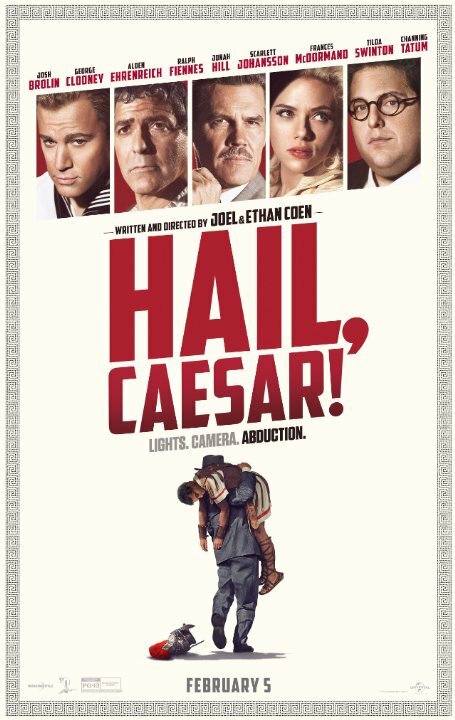 It all feels a little frivolous when compared to the Coen's best work but Hail, Caesar is consistently amusing - if never laugh out loud funny - although it may be completely lost on an audience not familiar with the movies it references. Fun but perhaps a little insubstantial.